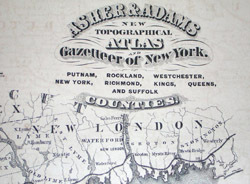 Asher & Adams New Topographical Atlas and Gazetteer of New York. Putnam, Rockland, Westchester, New York, Richmond, Kings, Queens, and Suffolk Counties. 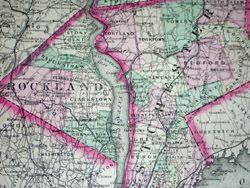 Map of counties encompassing metropolitan New York City. 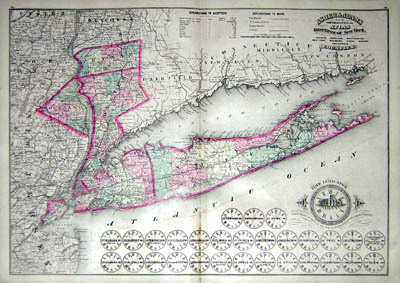 The map outlines Putnam, Rockland and Westchester Counties, New York City, and, most prominently, Long Island. 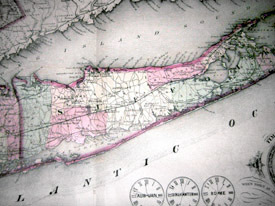 The counties and districts are colored in n shades of pink, yellow, and green. A key describes symbols used to denote railroads, wagon roads, survey roads, and canals. 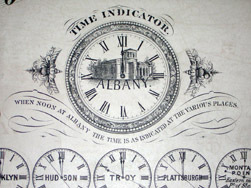 In the lower right portion is a vignette of a building in Albany inside the face of a clock within a decorative border, captioned “When Noon at Albany the Time is as Indicated at the Various Places.” Below the vignette are 29 clocks representing the actual times relative to Albany of cities and towns in New York State, such as Brooklyn, Rome, Buffalo, Niagara Falls, and New York . 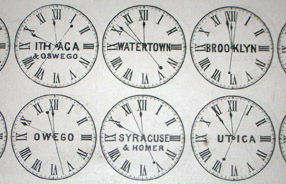 These clocks show small differences in local times as existed prior to 1883, when U.S. and Canadian railroads adopted standardized time zones as a practical matter of scheduling. Before then, most cities and towns relied on some form of local solar time, maintained by a well-known clock, for example on a public building or in a jeweler’s window. 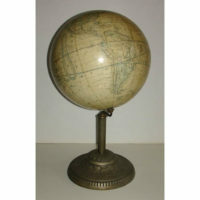 It was not until 1918 that Congress officially established standard time zones in the United States. 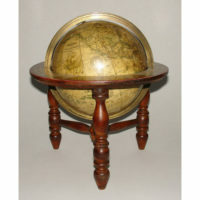 Asher & Adams was a New York City publisher of general maps and atlases. 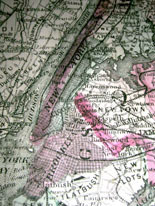 They produced three different versions of a New York State atlas in three successive years from 1869 and 1871. Condition: Generally very good with the usual overall light toning and wear. Vertical center fold as issued. Douma, Michael, ed. “Daylight Saving Time: First There was Standard Time.” Institute for Dynamic Educational Advancement. http://webexhibits.org/daylightsaving/d.html (30 April 2004). 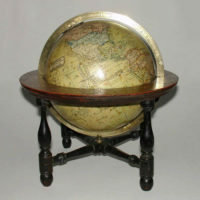 Ristow, Walter W. American Maps and Mapmakers: Commercial Cartography in the Nineteenth Century. Detroit: Wayne State University Press, 1985. pp. 441-442.